Nata in Vietnam, cresciuta a Mosca, da sempre in movimento da Londra e Parigi , Jessica Minh Anh oltre a modella è imprenditrice e fashion show producer. Realizza sfilate nelle location più iconiche al mondo: le organizza e sfila in passerella in prima persona. La location che ha scelto questa volta non ha nulla a che vedere con Les Tuileries, Palais de Tokyo, Louvre o Hotel Des Invalides. A differenza dei soliti (seppur très charmant) adresses de la mode, infatti, il fashion show in questione cambia coordinate geografiche e punta (letteralmente) molto in alto: la Tour Eiffel. 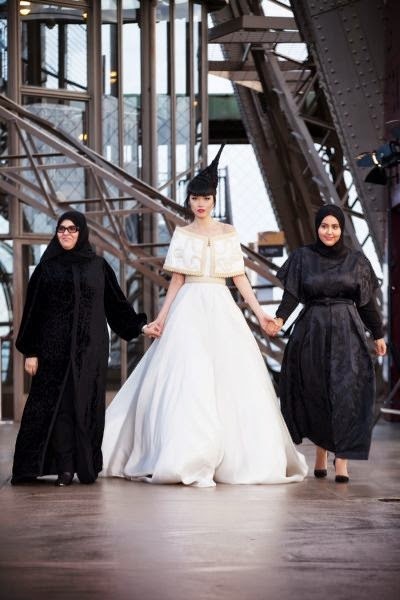 Che per la prima volta nella sua storia sarà trasformata nella passerella di moda più innovativa al mondo.Il merito va alla visionaria ed eclettica Jessica Minh Anh, modella e global fashion show organiser che ogni anno trasforma le più iconiche venues del mondo in incredibili catwalk. J Autumn Fashion Show 2014 segna l'ottava sfilata di Jessica, che dopo la Tower Bridge di Londra, One World Trade Center a New York, Grand Canyon Skywalk in Arizona, Gardens by the Bay’s Skyway a Singapore e il PETRONAS Twin Towers’ Skybridge a Kuala Lumpur, approda a Parigi.E per la Capitale francese non poteva non scegliere la Torre Eiffel, simbolo della città e meraviglia architettonica, che sarà lo scenario in cui Jessica Minh Anh presenterà una accurata selezione di capi di alta moda e pret-à-porter provenienti da 8 diversi Paesi, tra ospiti internazionali, ambasciatori e guru del fashion system e modelle, guidate da Jessica Minh Anh ,hanno sfilato lungo l’emblematico corridoio che circonda la Tour Eiffel, sul nuovissimo pavimento di vetro, per poi apparire davanti a 150 ospiti esclusivi. Superba e suggestiva la vista sul Trocadero e i Champd de Mars. "E'stato decisamente un momento storico. Un altro impeccabile spettacolo di Miss Anh” ha affermato Alan Williams,leader di UPS, il quale ha anche partecipato alla famosa sfilata di Jessica presso il famoso Tower Bridge di Londra nel 2011. Così come le precedenti ed inusuali sfilate , J Autumn Fashion Show 2014 ha combinato arte, cultura, architettura e moda. I marchi che ne hanno preso parte sono stati, brand che uniscono le tradizioni stilistiche dei Paesi di riferimento con tecniche avanguardiste e design contemporanei .Da Dar Naseem AlAndalos dal Bahrain, che fonde stile francese e marocchino per lussuosi caftani con dettagli innovativi, all'arte floreale di Debaj, passando per il cool knitwear della danese Beinta Poulsen, il tutto esaltato dalle architettoniche acconciature del Before Beauty Bar. Born in Vietnam, grew up in Moscow always moving between London and Paris, Jessica Minh Anh plus model businesswoman and fashion show producer.Realizes fashion show in the world's most iconic locations: organizes it and she slips off in first hand.The location he chose this time it has nothing to do with Les Tuileries, Palais de Tokyo, Louvre or Hotel Des Invalides.Unlike the typical (albeit très charmant) adresses de la mode, in fact, the fashion show in question changes geographic coordinates and toe (literally) very high: the Eiffel Tower.That for the first time in its history will be transformed into the most innovative fashion catwalk to the world. the credit goes to the visionary and eclectic Jessica Minh Anh, model and global fashion show organizer every year becomes the most iconic places in the world in incredible catwalk. J Autumn Fashion Show 2014 marks the eighth parade of Jessica, who after the Tower Bridge in London, One World Trade Center in New York, Grand Canyon Skywalk in Arizona, Gardens by the Bay in Singapore's Skyway and the PETRONAS Twin Towers' Skybridge to Kuala Lumpur, Parigi.E arrives in the French capital could not choose the Eiffel Tower, symbol of the city and architectural wonder, who will be the scenario where Jessica Minh Anh present a careful selection of high fashion garments and pret-à-porter from 8 different countries, including international guests, ambassadors and guru of the fashion system and models, led by Jessica Minh Anh, marched along the corridor surrounding the emblematic Eiffel Tower, the new glass floor, and then appear before 150 exclusive guests. Superb and impressive view over the Trocadero and Champd de Mars. "It was definitely a historic moment. Another flawless spectacle of Miss Anh" said Alan Williams, leader of UPS, which also participated in the famous parade of Jessica at the famous Tower Bridge in London in 2011. 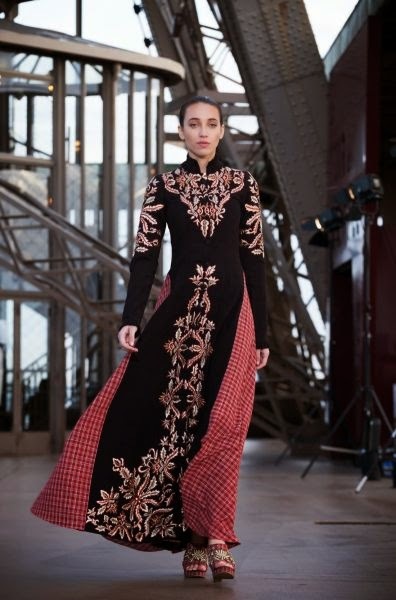 Like the previous and unusual parades, J Autumn Fashion Show 2014 has combined art, culture, architecture and fashion. the brands that took part were, brands that combine the stylistic traditions of the countries of reference with avant-garde techniques and contemporary designs .From Dar Naseem AlAndalos Bahrain, which blends French style and luxurious Moroccan caftans with innovative details, floral art of Debaj, through the cool knitwear of Danish Beinta Poulsen, all enhanced by architectural hairstyles Before Beauty Bar .